The Wars of Pooch: Painting Challenge update One! Well, here it is, my first update for the painting challenge. So, what I have I completed? 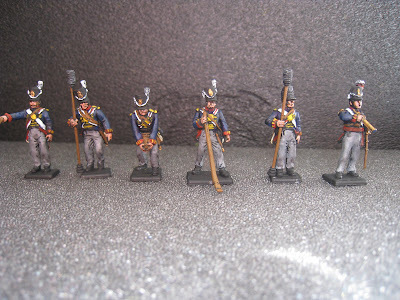 Well... no full stands of Napoleonics... but I did paint these six chaps! Six artillery crew; which marks exactly where I left off last time I painted Napoleonics! I had just finished their 3 guns, then got caught by a serious bout of "can't-be-bothered-itis". I just don't actually enjoy painting these guys, not sure if it is the Victrix faces (which I hate) or the combination of colours (I really hate yellow) but they just are not enjoyable to paint. What is enjoyable however, is that I only have 6 more to go! What's the plan then? Well, I am off on holiday on the 26th. Until the new year. Which means no painting (at all) will be done in that week! Which will keep putting me behind (darn it). So my goal before Christmas is to get this artillery battery done fully. I then plan to make up for the no painting week by a whole week where I am at home, and I don't have to work. It will be my goal to get as much painted in that week as possible! So look out for some frantic updates from the 2nd of january until the 9th of January! Oh, in other news I finished a secret test figure (pics tomorrow), and my Thirty Years War army is winging it's way towards me from the UK. Nice work, they look really good. Thanks!! Their guns are already painted- about 2 months ago! I have to ask Scott, what is your current reading material? I like painting the line infantry, just not the artillery crew. Too many fiddly colours! How do you find Blackpowder plays? Good stuff! I look forward to seeing the completed unit. I haven't really looked at Blackpowder; Lasalle was what really got me into gear with Napoleonics. I just looked too often at Ancients gamers just not having fun, and didn't want a part of it! Between Impetvs and Lasalle, they make for games which I enjoy. If your ruleset will do that too, I would love to have a look!